only sander i use now! this sander is the best! paper is available down to P24 grit... in rotex mode it makes for rapid marerial removal... use it for removing old paint and varnish alot. the dust extraction is nearly 100% which keeps the air clear and the pad clean for longer life. The RO150 is one heck of a sander. With the new Jet Stream Technology, dust collection is incredible.I would not recommend it to someone unless they know Festool and have a need to spend $500.00 on a sander. This sander will do more damage in a short amount of time if you don't know what your wanting to accomplish. I bought mine because I was refinishing my hardwoods in my home and the 3 different rental sanders were very abused and basically junk. My wife and I sanded 2500 sq/ft with the RO150 and RO125 down to bare Oak. Dust collection was great and the final 120 grit pass turned out a very nice floor. You sanded 2500 ft with a six inch RO? Yer nutz. Technically I own the RO 125 which is the 5" version of the same tool. I must admit it took a little getting used to. It is VERY aggressive if you slap on some 80 grit & leave it in the "Rotex" mode you better hold on. 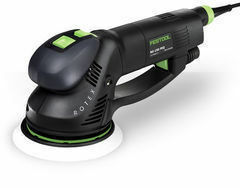 I quote here from a review on Festool Owners Group - "This is "dual-mode" sander, which means you have the option of working in an aggressive mode or a random-orbit mode. The aggressive mode is also called the "Rotex" mode, which is where the sander gets its name. In Rotex mode, the sanding pad spins in a more circular (rotary) motion. In Rotex mode, the sander takes down a lot of material very quickly, although it would not be used for fine sanding since it leaves some swirl marks on the wood surface. But when you switch over to random-orbit mode, the RO 150 can be used for fine sanding." You learn to let the tool do the work. I recently finished a solid walnut desk top that came out beautifully using only this sander through multiple actions & a series of grits. If you need to do some heavy sanding, such as, remove paint or get through some rough surface this tool is far ahead of a belt sander. The set up with a Festool dust collector is dust free which makes it a great tool when doing finish work in a client's home but also whenever you need to sand your work. I have even used it successfully on drywall! I highly recommend it. I also have the 125 size. Just for fun, I stripped a piece of wood to bare wood using the Rotex mode and 80 grit and then jumped to 180 on the fine setting. Even skipping all those grits ( not recommended) left a smooth, swirl free finish when the sample was stained and clear coated. Honestly, I was going for the 125, but they didn't have one in stock. The had the 150 available and at $525, it was a hard pill to swallow. Add a CT26 to it, and you're at $1000 just to sand wood. I'm thinking "no way am I spending this kind of money"
Well, what a PITA it is without the proper automatic on switch for the sander. The CT has one right on the front of the vac. Now the sander I use for cabinetry. I was getting it for use on refrigerator panels, flat door panels and top drawer fronts. Being 6" is kind of overkill for small thin face frames. Or is it? I tried it out and it is quite stable. Grabbed the hard pad and it stays really flat, even over the 1-1/2 wide face frame. Easily does 2-1/4" stiles and rails on the doors. I use mine in Rotex mode almost exclusively. It will tear right through material, so be careful. Test it on many pieces before putting it on your finished piece. If it is stain grade, you may want to put it in random mode for the final touch. Last job, I went straight to the 150 grit, rotex mode, and finished it off right there. Smooth, flat, dust free, done. Well worth it. It is actually a pleasure to sand now. Yes, the Festool tools, sanders in particular, are designed to work best with a high quality dust collector like theirs or the Fein. Way too much of a compromise to try to use these without suction. The vac actually helps the sander glide across the wood evenly. I was hesitant at first when I thought that this would take the place of my current Clarke 7R when sanding stairs. The 7R is great with fast material removal but when I need dust collection in combination with fast material removal then I just use my RO150. My customers are happy with the job and I leave their home virtually dust free. eats through wood like you can't believe! YOU CAN STRIP FINISH OFF OF OLD WOOD IN MINUTES! with virtually no dust at all when used with a dust extractor!